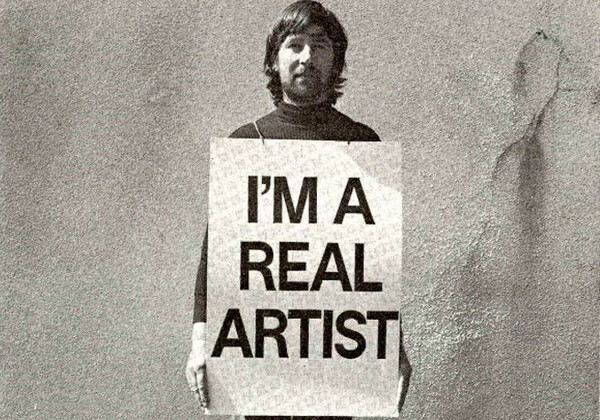 Are You a Pure or Applied Artist? Many people who work in the advertising and branding firms are full-fledged artists in their own right. At Wunderkind, we encourage this; in fact, we look for it. Why? Because we want people who have a point of view, who are in touch with what artists in different mediums and genres are doing around the world, who do not merely copy what other agencies are doing, but are able to show us something different. It used to be an ongoing inside joke in our industry that copy writers were failed novelists, or that art directors were failed artists. I don’t know whether this was in fact true in the 20th century, but certainly in this century and in my experience, many people who work in our business are bona fide artists in their own right, who have published books, put on exhibitions, gone on tour with a band. They do this while also applying their creativity and craft skill to client work. Yours truly has been writing poetry for over 20 years and has been published in literary journals. The fellow who helps me edit and find images for this blog is an accomplished painter who has put on beautiful exhibitions of his work. In fact, on one occasion he actually painted ad concepts for me, rather than doing them on a laptop. I’ve worked with art directors and designers who have been showcased at the Venice Biennale or Nuit Blanche. There is something refreshing and dynamic about doing both. There is a discipline and focus that commercial or applied art demands of you. (It’s good to remember that Shakespeare was writing plays on deadline for a theatre company that charged tickets at a box office.) And there’s a total freedom and inventiveness that is allowed by pure art, where there is no client and no deadline per se. It’s far richer than just saying that applied art is good for the bank account and pure art is good for the soul. They are both good for the soul, and quite frankly, our clients benefit from having writers and designers who are seriously talented and have mastered their chosen fields. A few years ago, on behalf of an innovative European paper products client of ours, we were tasked with developing a whole new look/feel and messaging for North America, based on a clear understanding of their brand philosophy. We put together a multi-national, multi-discipline team that included a design director in London who had ties to the Tate Gallery while developing a new visual style for Stella McCartney, and a hybrid painter/art director in Toronto coupled with a junior graphic designer from Korea who specialized in identity design. This unique and eclectic team was able to create a visual style that was striking, appealing and on-brand. The result: Happy client, intrigued consumers. And on top of that, the whole team learned about new artists and art trends that enriched their sensibilities.